After dedicating over 25 years to performing in local, national, and international venues, Doug Johns has developed and refined his own brand of horn-injected funk which merges virtuoso technical facility with sophisticated compositional skills. On the stage and in the studio, Johns has worked with the likes of Victor Wooten, Neil Zaza, Dweezil Zappa, Steve Smith, Buddy Miles, and many other notable artists. A couple years removed from the release of his acclaimed and self-titled debut as a solo artist in 2006, Johns produced Pocket Fulla Nasty, a groove-induced showcase of 11 tracks featuring an electric fusion of funk, jazz, and R&B styles. 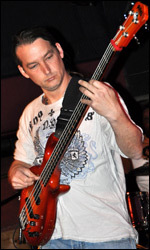 In addition to his numerous club and festival bookings with drummer Chris Ceja, Johns also maintains a busy schedule as an in-demand clinician who regularly performs and teaches at bass events around the United States such as the Mile High Bass Camp, the Rocky Mountain Bass Slam, the NAMM Bass Bash, and Bass Player Live. In this interview, Johns discusses his solo recordings, touring as one-half of a bass/drums duo, teaching, upcoming projects, and more. How did you get started on bass? Like most bassists, the band I was in at the time needed a bass player. Drums were my first instrument, and it wasn't until later that I realized how lucky I was to start out on drums. Rhythm is the whole deal. I'm self-taught, but I believe you become what you surround yourself with, and I have been extremely lucky to have learned, and continue to learn, from the players I grew up with. Who were your primary influences? Ray Charles, Buddy Rich, Thelonious Monk, Jimi Hendrix, Tower Of Power, Earth, Wind & Fire, Jaco Pastorius, Stanley Clarke, Pat Metheny. Could you tell us about the two recordings you have released as a leader? Stylistically, on my self-titled CD, I pretty much threw the whole kitchen sink in there! At any time, my drummer and co-writer, Chris Ceja, and I have at least two to three records in the can. By that I mean we pretty much live in the studio. On the first CD, we have a lot of variety in the tunes. My second CD, Pocket Fulla Nasty, I like to think is a little more compositionally defined. Guest artist-wise, these guys are all good friends, and I'm grateful they take the time to contribute to the groove. My sound relies heavily on their interaction. I'm sure some real engineers would cringe at my recording process. I've become better over the years, but we pretty much just setup the microphones and hit record, regardless of the acoustics or the medium for recording. To capture the groove, the way it's coming out of your soul at the moment, shouldn't be confined by any set of "rules." How did you learn to arrange the horn parts in your music? I'm very lucky to have Kenny Anderson on sax who has played with Arturo Sandoval, Tom Jones, and Gloria Estefan along with Joe Miller on trumpet as my principle horn collaborators. For most of the tunes, I'll have a rough sketch of the horn line and harmonies, but I'm a firm believer in letting the horns naturally evolve from a horn player. For some grooves, I'll totally hear the horns in my head while for others I never even imagine the horns until the guys show up with instruments in hand. I've always been influenced by Tower Of Power as well as Earth, Wind and Fire. I've always dug a big fat swingin' band! Where can your recordings be purchased? You can purchase my music through my website as well on iTunes, CDBaby, Abstract Logix, and Guitar Nine. How did your bass and drums duo come together with Chris Ceja? At first, it was totally based on economics. Nothing would be greater than going out on the road with the band of musicians you have on your recording, but in this day and age, that's tough to do. The budgets just aren't there on the road so Chris and I took a do-it-yourself approach and we haven't looked back. It's been a great learning experience for both of us. With just bass and drums, you have to learn to entertain first and foremost, and we always strive to keep it musical above all, not just appeal to bass players. Since you tour and conduct clinics along with Chris Ceja as a bass/drums duo, what aspects of playing bass within a rhythm section do you emphasize the most? That would definitely be learning to play the drum kit. Just being able to play even the simplest of grooves on the drums can really open your ears to the drummer's perspective. I know that I sound like a broken record here, but rhythm is the whole deal. Have you found there to be common weaknesses in the playing of those students who attend your clinics? There are times on the road that Chris and I will run into bass players who are truly unbelievable on the instrument, yet they struggle to play within a band. I think in this video world we live in that the most basic principle of jamming with other people is becoming a lost art. There is no better way to learn than getting out there and messing up on stage. That's exactly how I developed and continue to develop my groove. Believe me, I have a long way to go! Would you ever consider doing an instructional DVD or writing a book to illustrate your groove concepts? Yes! Chris and I are hoping to start filming a DVD later this summer. Do you follow any kind of process to familiarize yourself with chord changes when generating grooves? I think it's pretty much a never-ending process for me in the art of listening. It seems so simple, but really listening to the sound you put in the air is a very big responsibility. Sometimes the chords develop the road map for the groove and at other times the groove says, "Hey, I need this chord to survive." Whichever way it is in the moment, it all comes under the umbrella of listening if you are to make something truly musical. Is it important for bassists to develop their own sound to set themselves apart from other players? If you're playing from your heart and behind every note with your soul, that's what it's all about. I don't think I would consciously try to set myself apart. Just be yourself, and you can't go wrong with that. I'm really exited to be working on my third solo project which is looking to be released in late 2010. We're in the studio every day, and I love where this CD is going musically. It is also shaping up to be a great summer in terms of gigs. In May, Chris and I will be performing and teaching at the Rocky Mountain Bass Slam and Mile High Bass Camp in Colorado alongside the great Chuck Rainey. In June, we'll be performing at the 2010 Bass Odyssey in Tacoma, Washington where Chris and I will get to share the stage with Michael Manring. I'll also be playing at the Summer NAMM show and doing a bass show with Adam Nitti and Bryan Beller. Plus, we always have a lot of clinics in the works.